It's easy to say that all period dramas are vintage, but are they really? I like to watch them, whether it's a 1920s drama series saga like Downton Abbey, or the thrilling ITV drama The Bletchley Circle, and I count these as true vintage dramas, but in my opinion, anything before the 1920s is not vintage, but nostalgia. Vintage means something different to everyone and I will not try to debate what is the true era range of it, but I will give my views on the best Vintage TV Programmes. Firstly, although I like the new channel named 'Vintage TV' it is basically for music only, which is a shame because it could be really good. It has a lot of potential to broadcast vintage events, maybe do a tie in with The Vintage News (http://www.vintagenews.tv/default.asp?page=9) to report on all the nostalgia events? This amazing series launched in November 1993. the same day as Radio Days in Waterloo opened (coincidentally of course). The series tells the story of a modern day TV repairman called Gary Sparrow who lives with his wife Yvonne in Cricklewood, London. Whilst on a call out he stumbles across a time portal and is transported back in time to Wartime London, where he meets a lonely barmaid called Phoebe and begins a relationship with her across the times. Reasons to watch this: It has a terrific cast, fantastic one liners and although towards the last series vintage experts will spot that Phoebe's clothes are most definitely NOT authentic 40s but badly adapted 70s and 80s, it's definitely worth watching for the sheer audacity of some of Gary's claims. Best to watch: On a rainy Sunday afternoon. Kent in the 1950s. An oast house cottage. Seemingly eternal summer, it could only be The Darling Buds of May. based on the novels by H.E Bates. 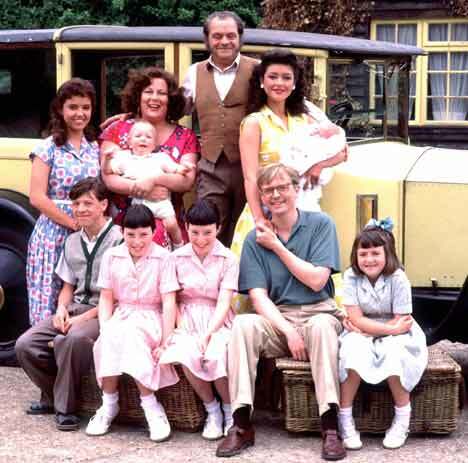 This series encapsulates a rosy depiction of life in the 1950s and revolves around the many members of the Larkin family. "Pop" Larkin is the eccentric and loving father. He has no regular employment but several projects and a succession of jobs provide income for the family. He invents things. His money-making schemes are often a side plot in each episode. "Ma" Larkin is the mother of the family. She is usually cooking food, tending the garden or caring for the children. Mariette Larkin is the eldest child. Her name was created by combining 'Marie' and 'Antoinette'. In the first episode she is shown to be the family beauty and slightly wild. However, she quickly marries Charley and settles down with him for the rest of the series. Montgomery Larkin (played by Ian Tucker) is the eldest son. He only appears for part of the series before joining the navy and attending college. Primrose Larkin is the second daughter. She reads romantic poetry and dreams of love. Her full name is Primrose Violet Anemone Iris Magnolia Narcissa Larkin. Zinnia and Petunia Larkin are the twins. They attend a boarding school, which they love. They share the middle names June Florence Nightingale. Victoria Larkin is the youngest daughter. She often plays with the twins but feels left out. Oscar Larkin is the youngest child. He grows from an infant to a toddler throughout the series. His full name is Oscar Columbus Septimus Dupont Larkin. Cedric "Charley" Charlton is Mariette's husband. He was a tax collector but gave up his job after falling in love with Mariette and the Larkins' life. He and Mariette eventually own a brewery . John Blenheim Charlton is Mariette and Charley's son. The plotlines of the episodes are generally very good, although some of them can seem a bit too sweet at times. Reasons to watch: The incredible 1950s costumes, (look out for Primrose's birthday dress and matching bolero) the beautiful Kent countryside and the nostalgia. Best to watch: On a Sunday evening. Not many people seemed to like this series, which was a shame, because the plots were very well written and the actual design was fantastic. I particularly liked the costumes, most of them from a specialist costume outlet, but some from American vintage boutique, Posh Girl Vintage. The characters were very well acted, Kate's exploits were always thrilling, and Christina Ricci as Maggie with her quick one-liners were brilliant, creating comedy in a very dramatic series. 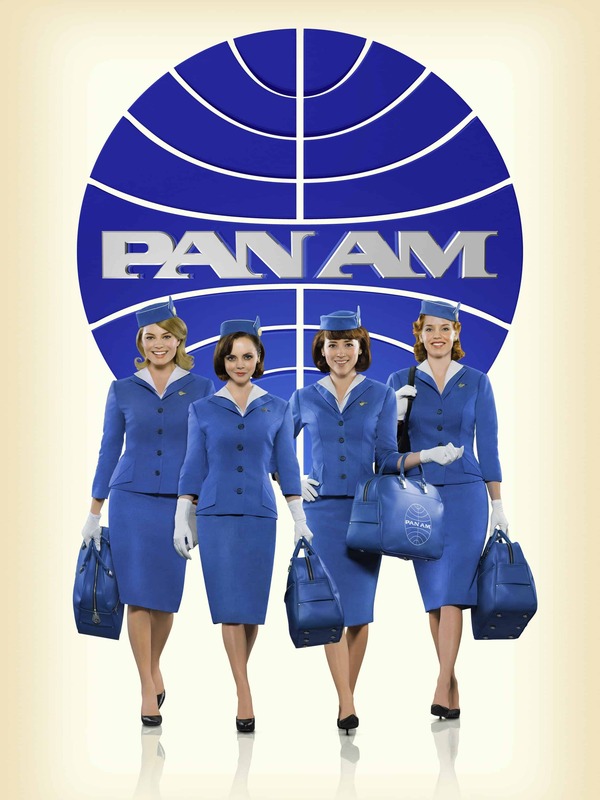 Somehow, despite all the hype and merchandise, Pan Am failed to make a second series, which is disappointing as it is a very good programme. 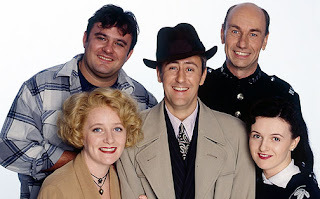 Still the series is available to buy on DVD. Reasons to Watch: For the costumes, sets and retro souvenirs. Best to watch: Vintage Night In. So there they are, feel free to add your favourites in the comments. Still, all of these are about the fashion!